The St. Louis Cardinals were 3-1-1 and battling to stay even with the Cleveland Browns in the NFL Eastern Conference race as they hosted the Washington Redskins on October 18, 1964. Coached by Wally Lemm, the Cardinals had a well-balanced offense with occasionally-erratic but typically effective QB Charley Johnson (pictured at right) throwing to outstanding receivers in split end Sonny Randle and flanker Bobby Joe Conrad or handing off to a good group of running backs led by HB John David Crow. The defense featured linebackers Dale Meinert and Bill Koman plus CB Pat Fischer and FS Larry Wilson. PK Jim Bakken was one of the league’s best. The Redskins, coached by Bill McPeak for the fourth year, were 1-4, having lost to the Cards two weeks earlier at home and won for the first time the previous week. Washington had not put together a winning record since 1955 but had made key acquisitions in the previous offseason, most notably QB Sonny Jurgensen, obtained from the Eagles, and MLB Sam Huff, formerly of the Giants. In addition, rookie HB Charley Taylor had been drafted in the first round out of Arizona State and was proving to be an excellent outside runner as well as pass receiver. There were 23,748 in attendance on a 60-degree day at Busch Stadium. They saw Washington start fast, scoring two touchdowns in the first six minutes of the first quarter. Jurgensen threw to Taylor for a 77-yard gain that set up a one-yard sneak by the quarterback for a TD. On the first play following the ensuing kickoff, Charley Johnson fumbled while rolling out and DT Joe Rutgens recovered for the Redskins. Jurgensen threw to split end Angelo Coia, who beat CB Jimmy Hill for a 32-yard touchdown. Including two successful extra points, it was 14-0 in favor of the visitors. Before the opening period was over, however, Jim Bakken kicked a 17-yard field goal for the Cards and then Dale Meinert recovered a fumble by Washington HB Tom Tracy at the Redskins’ 27. St. Louis quickly capitalized when Johnson passed to Sonny Randle for an 11-yard TD. The score was 14-10 after a quarter of play. Midway through the second quarter St. Louis took the lead when a 35-yard drive ended with John David Crow running for a nine-yard touchdown. With time running out in the first half the Cardinals went 52 yards on a possession that ended when Johnson fooled the Redskins defense by passing to a wide-open TE Jackie Smith for a one-yard TD pass. The Cards were up by 24-14 at the half. Neither team was able to move the ball during the third quarter, but two interceptions set up Washington scores as the Redskins defense proved effective against the St. Louis offense for most of the second half. Johnson had difficulty completing passes until midway through the final period. Early in the fourth quarter, CB Johnny Sample intercepted a Johnson pass at the Washington 28 and returned it to the 44. The Redskins took advantage as Taylor ran for a 37-yard gain and Jurgensen completed an 18-yard pass to star flanker Bobby Mitchell for a touchdown to make it a three-point game. 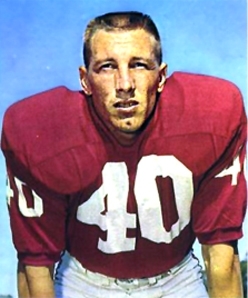 LB Jim Carr intercepted another pass by Johnson that gave the Redskins good field position at the St. Louis 49. The ensuing drive stalled at the 15 and a well-thrown Jurgensen pass was dropped by Coia in the end zone. Washington had to settle for a field goal by 40-year-old Jim Martin from 24 yards out to tie the game at 24-24 with just under two minutes left to play. The Cardinals took possession at their 27 to start the ensuing drive. Johnson, who had been ineffective for much of the second half, threw to FB Joe Childress (pictured at left) for a 30-yard gain. Following two runs by Childress that added another 13 yards, Johnson then connected with split end Bill Gambrell for 11 yards to the Washington 19 with the clock down to 48 seconds. A five-yard completion to Conrad was followed by a short run by Crow and then Johnson’s pass to Conrad, who broke two tackles, for a 12-yard touchdown. Now down by seven points, a desperate Jurgensen threw a desperation pass that was intercepted by Pat Fischer and returned 39 yards for a TD to seal the 38-24 win for St. Louis. The Cardinals had more total yards (366 to 264) and far more first downs (26 to 9). But four turnovers, including the two damaging interceptions that led directly to Washington scores, hurt St. Louis while the Redskins turned the ball over three times. 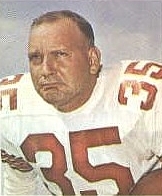 In addition, Johnson was sacked five times while the St. Louis defense failed to register any sacks at all. Charley Johnson completed 17 of 30 passes for 226 yards with three touchdowns but also three interceptions. He also gained 32 yards on four rushes. Joe Childress ran for 86 yards on 15 carries and caught two passes for 48 more yards while John David Crow contributed 53 yards on 16 attempts that included a TD. 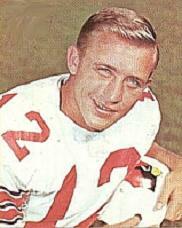 Bobby Joe Conrad (pictured below) was the top receiver for St. Louis with 5 catches for 52 yards and the game-winning touchdown. For the Redskins, Charley Taylor had a big day with 62 yards rushing on 9 carries and three pass receptions for 81 yards. Sonny Jurgensen was successful on 11 of 25 throws for 159 yards and two TDs with one intercepted. Bobby Mitchell and Angelo Coia each had three catches for 35 yards and scored a touchdown. The win kept the Cardinals even with the Browns atop the Eastern Conference, but a midseason slump hurt their chances and while they finished up with four straight wins, it gave them a 9-3-2 record that placed second to Cleveland’s 10-3-1. The Redskins won five of their next six contests and ended up tied for third in the conference with Philadelphia at 6-8. Charley Johnson led the NFL in pass attempts (420), completions (223), yards (3045), and, more unfortunately, interceptions (24) while ranking fourth in touchdown passes with 21. Bobby Joe Conrad was the fourth-ranked pass receiver in the league with 61 catches, good for 780 yards (12.8 avg.) and six TDs. He was selected to the Pro Bowl. Sonny Jurgensen had a good first year in Washington, ranking second to Johnson in pass completions (207) and yards (2934) while ranking ahead in touchdown passes (24) and with far fewer interceptions (13). Like Conrad, he was chosen for the Pro Bowl. Charley Taylor (pictured below) had an outstanding first year, garnering Rookie of the Year and Pro Bowl honors as he rushed for 755 yards on 199 carries (3.8 avg.) and caught 53 passes for 814 yards (15.4 avg.) and totaled 10 touchdowns. Two years later, he was shifted to split end as he went on to a 13-season Hall of Fame career.